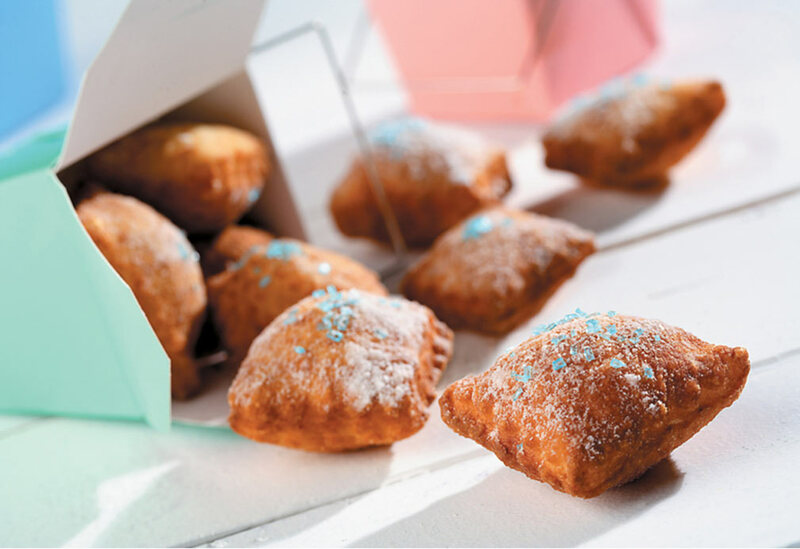 These little dough puffs will melt in your mouth. They are popular in Mediterranean countries and a treat during Hanukkah. Canola oil’s high heat tolerance is ideal for frying the dough. 1. In small bowl, pour warm water, sprinkle yeast and sugar on top and whisk to dissolve. Let stand for 6 minutes until it starts to bubble. 2. In large bowl, add warm milk and yeast mixture. With wooden spoon, beat in eggs and canola oil. Add flour and salt, mixing to form wet dough. 3. Cover with plastic wrap and let sit in draft-free space for 45 minutes or until double in size. 4. Stir dough down and re-cover and let double again in bulk, about 30 minutes. 5. Meanwhile, using deep fryer or wok, heat canola oil to 375 °F (190 °C). Use deep-frying thermometer. 6. Dip spoon in warm water then scoop 1 Tbsp (15 mL) dough to form ball and repeat until 4-5 balls have been formed. Dough will be very tacky so make sure you dip spoon in water after each ball. Add 4-5 balls to fryer at time and fry until golden brown on bottom and then, using wooden or metal spoon, roll them over to cook other side, about 3 to 4 minutes per batch. 7. Remove dough balls from oil and drain on paper towels. Repeat until all dough has been fried. Between batches, you may want to stir dough, as it will rise. Meanwhile, in small saucepan, heat honey and water to create glaze. 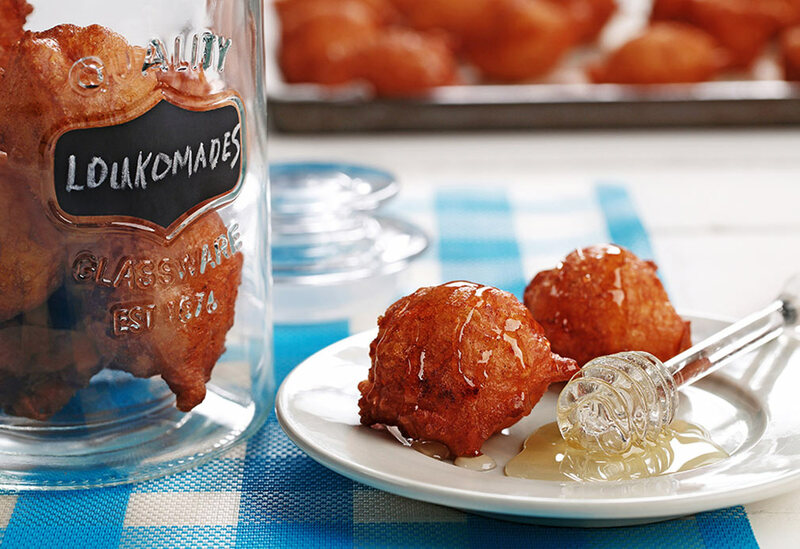 Drizzle on top of fried loukomades. Sprinkle with cinnamon and nutmeg. 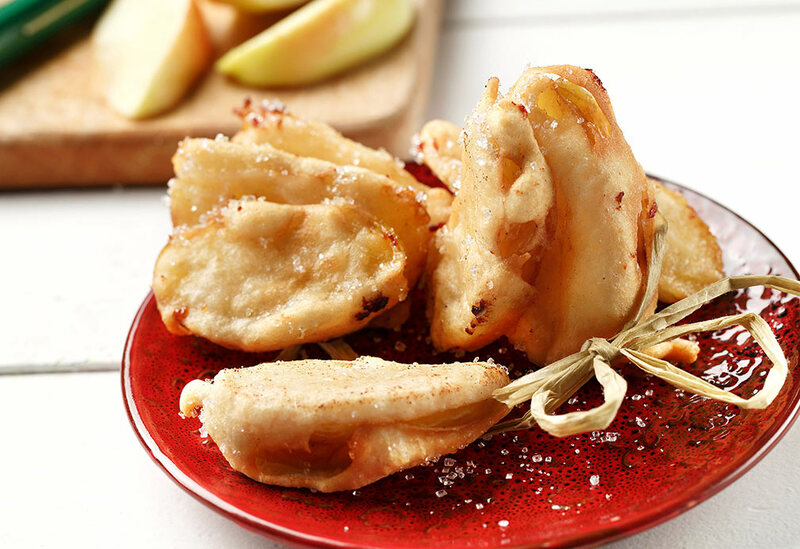 Freshly made apple fritters are a hot, tasty alternative to store-bought. Canola oil is a great choice for high heat cooking. Canola oil has one of the highest smoke points of all commonly used vegetable oil at 468 °F (242 °C). 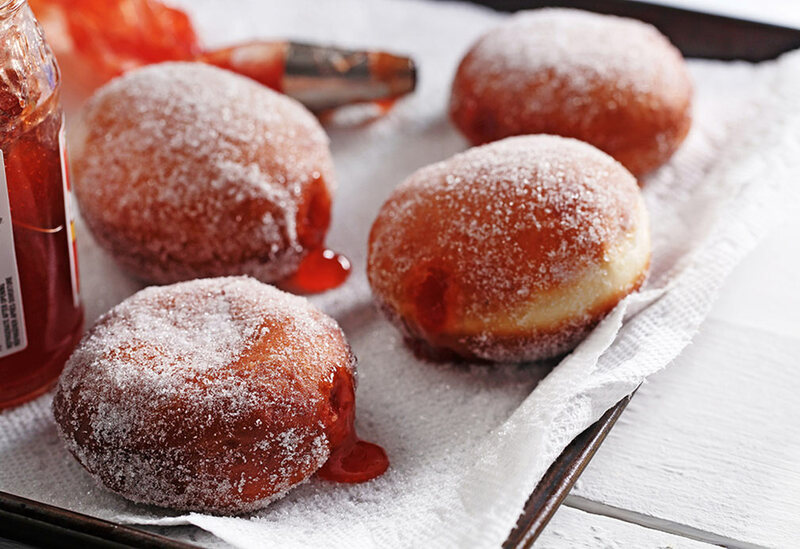 Sufganiyots are jelly-filled doughnuts sprinkled with sugar that are served around the world during the Jewish festival of Hanukkah. When it comes to deep-frying, canola oil’s high smoke point can take the heat.